Cheapest I could find this TV for, most places selling it at £1799 without the no gap wall mount which seems to be an extra £130 on top at most online stores. I haven't a clue whether this is better deal or not but in Costco they are doing an LG OLED 65" for around the same money. That depends on Personal opinion and viewing conditions really. Too much for a mid range LCD, albeit a goodish one. Either the Sony XF9005 cheaper or the LG B8 slightly more, represent better value. QLED's are guaranteed against screen burn, OLED's are not. 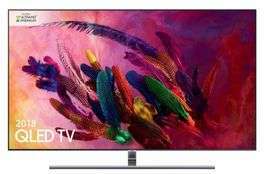 If it was really that difficult to get screen burn on an OLED why is not one single solitary manufacturer or seller of these TV's including coverage against screen burn in their guarantees? Nobody is going to go out of their way to get screen burn in an OLED it's something everyone dreads and effectively calling everyone who got screen burn a 'moron' is a fantastic way to put anyone off buying an OLED so good job there if that was your intention. Hi i got the 65” b8 last week n I’m confused with all the different picture settings n stuff.if you have a settings video a link would be much appreciated. QLED's are guaranteed against screen burn, OLED's are not. If it was …QLED's are guaranteed against screen burn, OLED's are not. If it was really that difficult to get screen burn on an OLED why is not one single solitary manufacturer or seller of these TV's including coverage against screen burn in their guarantees? Nobody is going to go out of their way to get screen burn in an OLED it's something everyone dreads and effectively calling everyone who got screen burn a 'moron' is a fantastic way to put anyone off buying an OLED so good job there if that was your intention. To be fair there would be people who would deliberately leave an image on the screen for days on end so they could claim for a new TV/screen near the end of the warranty period. Hi i got the 65” b8 last week n I’m confused with all the different pic …Hi i got the 65” b8 last week n I’m confused with all the different picture settings n stuff.if you have a settings video a link would be much appreciated. Yes mate i have one dedicated to my settings. I will PM it to you after i have finished working out as i can't do it on my phone. Yes mate i have one dedicated to my settings.I will PM it to you after i …Yes mate i have one dedicated to my settings.I will PM it to you after i have finished working out as i can't do it on my phone. To be fair there would be people who would deliberately leave an image on …To be fair there would be people who would deliberately leave an image on the screen for days on end so they could claim for a new TV/screen near the end of the warranty period. Maybe so but I can't imagine all the people complaining of screen burn have done something really stupid to make it happen. Regardless, as far as I'm concerned the day they offer guarantees that cover screen burn is the day I buy an OLED. If that never happens I want nothing to do with them. I play a lot of games and don't want to have to think about what to do or not to do the whole time I use my TV. I just don't think people should be mocked for opting out of the OLED burn lottery out of paranoia it's as valid a reason not to purchase a particular type of TV as any other. Maybe so but I can't imagine all the people complaining of screen burn …Maybe so but I can't imagine all the people complaining of screen burn have done something really stupid to make it happen. Regardless, as far as I'm concerned the day they offer guarantees that cover screen burn is the day I buy an OLED. If that never happens I want nothing to do with them. I play a lot of games and don't want to have to think about what to do or not to do the whole time I use my TV. I just don't think people should be mocked for opting out of the OLED burn lottery out of paranoia it's as valid a reason not to purchase a particular type of TV as any other. I just made a statement about how people may abuse warranty claims. For what it’s worth I think the Samsung QLED’s are the best TV’s you can get if you don’t want an OLED. I never mocked anyone.I just made a statement about how people may abuse …I never mocked anyone.I just made a statement about how people may abuse warranty claims.For what it’s worth I think the Samsung QLED’s are the best TV’s you can get if you don’t want an OLED. Remember 65" Q8 was £1199 after Christmas. Never forget this! Never to be repeated, so never to be purchased! Remember 65" Q8 was £1199 after Christmas. Never forget this! Never to …Remember 65" Q8 was £1199 after Christmas. Never forget this! Never to be repeated, so never to be purchased! Can you please show me evidence of LCD (QLED) screen burn? Why do you want me to search for it ? If it helps you when you google it , try 'image retention' too as that's just another name the industry uses for it. We are (i think) on about the 7th / 8th generation of OLEDs I believe , early adopters may well have experienced issues. my comments were related to the latest models in which they have addressed the issues that once were and now benefit from inbuilt protection against screen burn. Costco's guarantee will cover everything , screen burn too ! Just return to store for a full refund anytime before the expiry of the 5 year warranty. To be fair though it was a pricing error which was quickly (within a couple of hours I believe) removed from the shelves across all stores. Perhaps not to be likened with a genuine 'offer' or 'sale price', if it was then I would probably have been with you on that as I'd just wait for the next sale/offer. To be fair though it was a pricing error which was quickly (within a …To be fair though it was a pricing error which was quickly (within a couple of hours I believe) removed from the shelves across all stores.Perhaps not to be likened with a genuine 'offer' or 'sale price', if it was then I would probably have been with you on that as I'd just wait for the next sale/offer. I hear what your saying but I was actually in the shop and able to get one for 719. I unwisely decided against for some strange reason. So yes under normal circumstances I would just consider it a misprice that few got. Although I didn't call everyone that got screen burn a moron did I. Normal people (ie those that do not watch the same channel displaying a static image on their screen all day , every day) will generally not have these issues on the latest gen OLEDs. For piece of mind though, like I said , buy from Costco and you are covered. A lot of people on here missed out , even stories of people ringing the store and by the time they got there the shelves had been cleared by the staff. wow, you put it back OMG. I feel your pain , although very much self …wow, you put it back OMG. I feel your pain , although very much self inflicted it must be said. ‌ A lot of people on here missed out , even stories of people ringing the store and by the time they got there the shelves had been cleared by the staff. The staff did clear the shelf about half an hour later whilst I was still there. All the new and display went on a trolley and carted off. I asked where they were going and he told me about the mistake. I'll learn from that mistake. The staff did clear the shelf about half an hour later whilst I was still …The staff did clear the shelf about half an hour later whilst I was still there. All the new and display went on a trolley and carted off. I asked where they were going and he told me about the mistake.That just made me feel. Worse I'll learn from that mistake. I would have been beaten about the head is more accurate. I have a c6 new in its box, a Panasonic v20 new in its box and a Panasonic g20 new in its box. Thats 3 new tellies never used and if you know your tv's you will know how long they have been sat. 4 new tellies in boxes may well have resulted in murder! Although I didn't call everyone that got screen burn a moron did I. Normal …Although I didn't call everyone that got screen burn a moron did I. Normal people (ie those that do not watch the same channel displaying a static image on their screen all day , every day) will generally not have these issues on the latest gen OLEDs.For piece of mind though, like I said , buy from Costco and you are covered. I actually just ordered a Q7F got a really good deal and a price match from JL. It's brilliant that Costco have that guarantee and it certainly would have been an option had I known and I'll bear it in mind for the future. My biggest issue at the moment is upscaling I thought all modern 4K TV's were similarly good but just got rid of a Q8D that made my blurays look like VHS videotape quality I'm hoping I just got a bad panel. ‌ ‌ for a bottom lit TV no thanks oled (LG) all the way for that kind of cash!! You got owned my friend! Already have a Samsung 55" and 65" Qled but I'm envious of those with the better OLEDs. I paid current OLED prices for mine when I got them as at the time OLED was pretty much double the price of the QLED. With prices now looking this close for me, right now its a no brainer which I'd choose. That said I would opt for a Costco bought OLED , just to have their superb money back warranty for 5 years. Yeah say that to yourself when your OLED has screenburn. Best of luck. …Yeah say that to yourself when your OLED has screenburn. Best of luck. Noob.